Sadly, Lexi crossed the rainbow bridge on September 4, 2016. After a short, three month battle with carcinoma, seizures resulting from renal failure put an end to the fight. Besides being our beloved little girl, Lexi was an actress, a therapy dog, a freestyle dancer, and so much more. Following is her own introduction to her story. I hope you enjoy it as much as we enjoyed living it. I am Lexi, a ten twelve thirteen-year-old miniature schnauzer. My Mom likes to add, “She is a black and silver, which is one of the three recognized colors by the AKC. The others are salt-and-pepper and all black.” If I weren’t so proud of my beautiful hair I would be embarrassed. I am rarely embarrassed. If I am embarrassed it is usually because of something my stupid brother Riley has done. More on that later. She also goes into this diatribe about how I have hair, not fur, which is what accounts for me being non-allergenic. I believe that means that people don’t sneeze when I am around them, unlike when other dogs with that nasty fur is around them. Then she expounds on the intelligence and faithfulness of the schnauzer breed. At that point it is my job to look at them like I am thinking of something really important, like one treat plus one treat equals one treat, or ground beef comes from the grocery store. Sometimes I think about if it is late enough in the afternoon to start campaigning for supper. But that can cause drooling, which sends the image the wrong direction. I was lying around on Mom’s bed while she was at work, pondering the meaning of life, as well as what would increase my chances of getting more treats. Then it hit – fame! So I came upon this idea of Mom telling everyone about my life so that I would be famous and get so many treats that I would never want for treats again. Hmmm. Not so sure that came out right. I will always want treats. What I meant is I would never have a lack of treats – I can already see this writing business can be tricky. Anyhow, I would make a bed out of all those luscious treats and lay in it and eat them whenever I wanted. Mom would keep pouring more in my bed so that I never ran out. Oh, heaven! Fortunately, she has been helping me keep a diary for quite a few years. Unfortunately, she has also helped some of the other dogs in the household keep a diary. That means some of their junk is going to pollute what should be just about me. Eh bien, as my French friend Pierre would say. That’s life, or oh well, or something like that. As long as I get all the treats, I suppose it doesn’t matter. Me, 6 weeks . 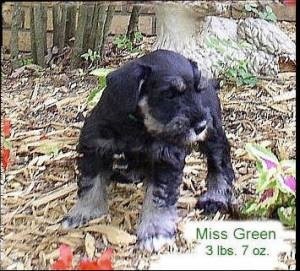 I was originally called Miss Green at the breeder’s because I was the one who wore a green collar. Let’s start with my not-too-humble beginnings. I was born to a pair of properly introduced miniature schnauzers – a planned parenthood, if you will, deep in the heart of Georgia. There were four others in the litter, and not one of them was as active and boisterous as little old me. I stayed awake the longest; I tore up the most newspaper and howled in the middle of the glorious mess; I jumped and bit at the air escaping from the floor registers. In other words, I had the joie de vie that would carry me throughout my life. I was already an over-achiever. My Mom had picked out the one she had pre-named “Anna Bell” through a six-week e-mail exchange. I’ll never be sure why she didn’t just grab her and go after the three hour drive to where we were all living. Instead, she sat on the floor and watched us for a couple of hours. Then she took a break, probably for food since I know it was at least noon and my stomach was growling for lunch. She returned and sat and watched a spell longer. Pointing at me, she finally declared, “That is the one I want. 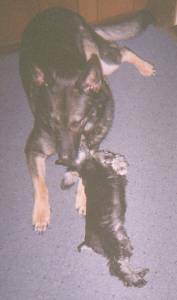 She is the one who can deal with the big German shepherd dog at home.” So hands were shaken and money exchanged and she left with the promise to return for me in two weeks. Her parting words were, “She’s no Anna Bell. I am going to have to think of a different name.” My passion for food must have been evident quite early, as I ended up being named for a restaurant in North Carolina – Lexington Barbeque. Although I liked the idea of eating all the food in this BBQ joint, it gave me a bit of discomfort when I considered that my name might make some people mistake me for the food. Thankfully, everyone just calls me Lexi. True to her word, my soon-to-be mom returned with Ara, the big German shepherd dog, in tow, to claim me two weeks later. She said out of all the little puppies, she chose me. We drove and drove and drove for what seemed like forever to someone (me) who had never even seen a car before, until we reached my new home in the state of Tennessee. So you see, I am a Dixie girl at heart, even though I don’t think my bark has much twang. That is probably due to the fact that my Mom moved to Tennessee from Pennsylvania – yep, she’s a Yank. She’s picked up a bit of a southern accent, but it’s mostly Southern idioms that, like y’all, have crept into her speech. I say this in the way of explanation of my bi-lingualness. Northern and Southern blended into the most beautiful bark, whine, howl and other speech patterns such as “uh-huh.” I came to my new, forever home on the Fourth of July, so you might just say I am an All-American dog. Once in my new home, I began to assess my situation. There were towels and dog toys around, so one of the first things I did was pull a towel into the middle of the room and pile all the toys on it. I climbed to the top of the pile and lay down so that everyone would understand that this was now my towel and my toys. You have to establish your dominance early, you know. Next I had to figure out how to deal with Ara. It is good that I am fast since in the beginning I had to leap under chairs to avoid being run over by the big oaf. Me on my boat in the horrid yellow vest. Don’t I look like a bumblebee? day. Mom took me to her little pontoon boat, the Sammy Joe. She said her dog Sammy Joe was her first boat dog, so she named the boat after him. When she told me that, I thought, “She will re-name it after me pretty soon, ‘The Lexi B’” Has a nice ring to it, huh? As we were walking into the house after a great day on the lake she pulls out this horrid bright yellow puppy life vest. She made me put it on to see if it fit and I was horrified. I was even more horrified when out comes the camera again. Now don’t get me wrong – I love having my picture taken. I am a natural, never a bad shot. But why does she have to immortalize these most ignoble moments? I stood frozen to the spot. I couldn’t move. I wouldn’t move. She had to pick me up and set me back down where she wanted me, still standing on my stiff little puppy legs. She must not have understood – could not have understood – as she put it back on me the next time we went out on the boat. Again, I turned into a statue. 1. I love food. Anytime. Anywhere. Anything. 2. I hate clothes. Any kind, anywhere, anytime. 3. I rule, except when there is a much bigger dog that could hurt me. 4. It’s mine. Now. Not his or hers or yours – mine. Now, not later. Remember these things and my diary/blog will make much more sense to you. I was about a year old when I began notating my life. You will see that I become more mature and sophisticated as time goes by. 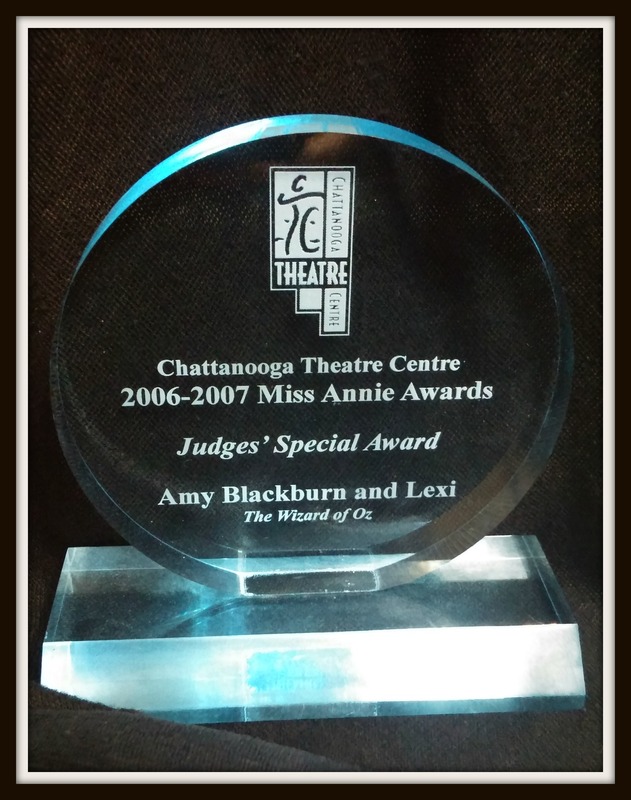 Now, I have my very own seat at the Chattanooga Theatre Centre any time I want to go! How did that happen, you may ask. You will find the answer to that question in my bio. Nice to meet you Lexi. I’m with you, you can never ever have too many treats. Benji P.S. my big furster Ms. Zulu also says hi. 🙂 P.S. 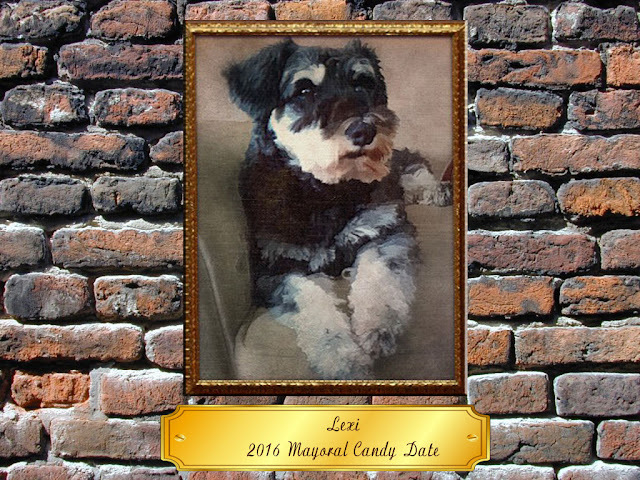 To bring you up to speed, Lucy is the reigning queen in the lexitheschnauzer blog. My heart dog, Lexi, left to meet her Creator last September. Ohh, we are truly sorry. Our Pinecone Forest Queendom has had losses that are still felt. It’s always sad when one’s critter companion dies, and I am sad to learn that Lexi passed last September. Hugs and shared grief for your loss. She was a pretty girl, and she was of a smart, lovable breed of dog. I am certain she is missed every day. Thank you, and yes, every day. I lost my first kitty, Freckles, in 2009, and I still miss that little purr buddy to this day. More hugs. ONE last quick read before Mom makes me go to bed. I’ll be back. Oh, and thanks for coming to see my star turn in Bacon’s Spotlight. Mom doesn’t have a video camera anymore and she barely knows how to use that little box that she talks to, so I guess I’ll have to be a guest-blogging Shih Tzu forever (if Mom ever turns the computer over long enough for ME to blog more, that is). So glad to have such a fun candidate against me! Hi Monika and Sam! I love that you stopped by. Come back any time. Monday will be my first Monday of the month Memory Monday. Hi Puppydoc! Please, follow all you want. 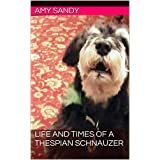 In fact, if you want the whole scoop on my life, check out my Kindle book, The Life and Times of a Thespian Schnauzer. You can get to it from the right hand column on my blog. But please don’t feel pressured. 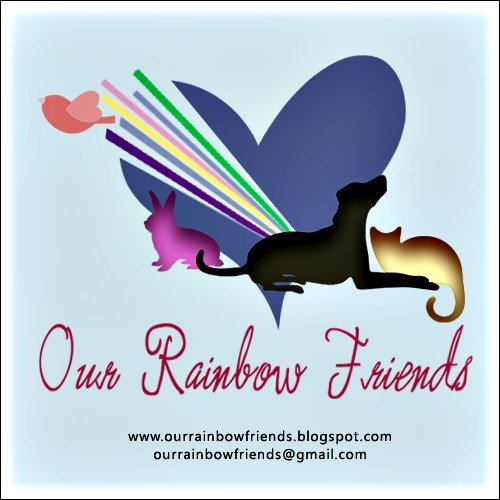 Sometimes a little blog is all a person wants, BOL! Mom and I will go check out your blog, too! And, uh, is Samantha a nice to dogs kind of kitty? Looking forward to following Lexi’s adventures! Mew mew mew Lexi yur a gurl aftur mee own heart!! Joy da Vee an bouncey an playfull an bouncey an clevurr!!! Yur mee as a doggie!! Mew mew mew!!! That Ara iss ONE BIG dooggie!! PICKERELL!! An you tried to take him on?? Oh sorry mee iss all xcited here…. Oh my, maybe you are safer on land. What if you accidentally fell off the boat and a croc ate you! My sister Lily who has crossed the rainbow bridge knocked me into the lake last year. She acted like it was an accident, but the big push from her behind felt “on purpose!” We were still tied to the dock, so I didn’t even have my pink polka-dot life vest on yet. Good thing I am an excellent swimmer! She made you wear a life vest! I think that would get me frozen on the spot too! Thanks. *blush* I am also a stage star. *blush* Check out my Wizard of Oz posts. 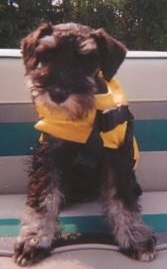 I wonder if your Mom would let you go on the boat if you wore a doggie life vest. It wouldn’t have to be pink polka dot like mine. My last one was a plain yellow. Of course there might be worse things in your rivers and lakes than big catfish and gar. Ooooo! I know someone Famous! Do you do autographs? I would love to have your autograph. Maybe Mum would let me on the boat if I wore a life jacket (I don’t like the idea of wearing one but polka dots sound awesome! Maybe blue ones? ), but the thing is she says I get too excited and wont sit still. Then Mum can’t sit still and she says the whole point of going on the boat is to relax and sit still. Now that I’m older I’m sure I wouldn’t be as wriggly – I just need to persuade Mum, that’s all. We also have catfish – they’re not that big though – but we also have crocodiles and hippos. Now THEY are huge. And scary.